This chart provides information on India’s arsenal of ballistic and cruise missiles. It is updated on a rolling basis to include the dates of the latest tests and other developments as they occur. An asterisk beside a data point indicates that this information did not come from an official source but from a reliable, secondary source. a. The Prithvi-I will reportedly be withdrawn from service and upgraded. c. This test was reportedly not successful. d. The boost phase is solid-fueled while the cruise phase is powered by a liquid ramjet engine. e. The BrahMos is deployed on multiple platforms. Each deployment has its own designation. N-I refers to deployments on surface naval vessels. Blocks (B) I-III refer to deployments with the Indian Army. 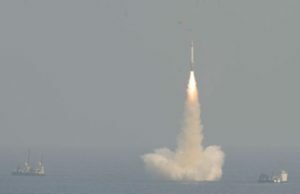 ALCM refers to Air-Launched Cruise Missiles and SLCM refers to Submarine-Launched Cruise Missiles. f. The boost phase is solid-fueled while the cruise phase is powered by a liquid turbofan engine.